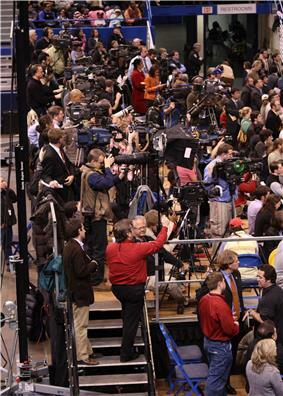 Media of the United States consist of several different types of media: television, radio, cinema, newspapers, magazines, and Internet-based Web sites. The U.S. also has a strong music industry. Many of the media are controlled by large for-profit corporations who reap revenue from advertising, subscriptions, and sale of copyrighted material. American media conglomerates tend to be leading global players, generating large revenues as well as large opposition in many parts of the world. With the passage of the Telecommunications Act of 1996, further deregulation and convergence are under way, leading to mega-mergers, further concentration of media ownership, and the emergence of multinational media conglomerates. These mergers enable tighter control of information. Currently, six corporations control roughly 90% of the media. Critics allege that localism, local news and other content at the community level, media spending and coverage of news, and diversity of ownership and views have suffered as a result of these processes of media concentration. The organisation press freedom records. In 2013-14 United States was ranked 46th out of 180 countries, a drop of thirteen points from the preceding year. The Federal Communications Commission (FCC)in 1970 had limited the number of radio station one person or company could own to 1 am and 1 FM locally and 7 am and 7 FM stations nationally. See IBOC and HD Radio. A new form of radio that is gaining popularity is satellite radio. The two biggest subscriptions based radio services are Sirius Satellite Radio and XM Satellite Radio, which have recently merged to form Sirius XM Radio. Unlike terrestrial radio music channels are commercial free and other channels feature minimal commercials. Satellite radio also is not regulated by the FCC. Ninety-nine percent of American households have at least one television and the majority of households have more than one. The four major broadcasters in the U.S. are the National Broadcasting Company (NBC), Columbia Broadcasting System (CBS), the American Broadcasting Company (ABC) and Fox. DirecTV and Dish Network are the major satellite television providers, with 20 and 14 million customers respectively as of February 2014. Meanwhile, the major cable television providers are Comcast with 22 million customers, Time Warner Cable with 11 million, and Cox Communications, Charter Communications, AT&T U-Verse and Verizon FiOS with 5-6 million each. The U.S. has three leading weekly newsmagazines: Time, Newsweek and U.S. News and World Report. Time and Newsweek are center-left while U.S. News and World Report tends to be center-right. Time is well known for naming a "Person of the Year" each year, while U.S. News publishes annual ratings of American colleges and universities. ^ Martin, Abby (6 June 2013). GMO labeling law fail, DNA databases, Media censorship, Geo-engineering as playing God?. Breaking the Set on RT. Retrieved 11 January 2014. ^ "World Press Freedom Index 2014".